AMHERST, N.Y. – Business, educational, and other community partnerships that promote sustainability and environmental change will be showcased at the 14th annual Western New York Environmental Summit scheduled for Sept. 29 at Daemen College. The summit, “We Are All Partners in Change,” will be held from 8:30 a.m. to noon in the Wick Campus Center Social Room. Registration and breakfast for all attendees at the environmental-focused event, which is free and open to the public, will take place from 8:30 to 9 a.m.
Exhibitors from more than 25 local environmental, business, and grassroots organizations will be on hand starting at 8:30 a.m. with networking from 10 to 11 a.m.
A panel discussion, “Local Success Stories and How to Create Your Own,” from 11 a.m. to noon will feature five Western New York projects and their process for successful projects. As part of the Environmental Summit, a community electronics recycling collection will take place outside the Wick Center. 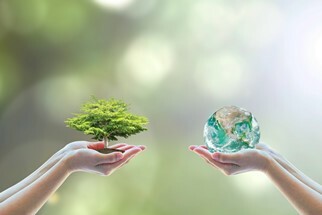 The Environmental Summit is being sponsored by Daemen’s Paul A. Saffrin Center for Sustainability and Civic Engagement and the Global and Sustainability Program, The Knoer Group, and Western New York Apollo Alliance. Additional information is available at daemen.edu/summit.